Building your monitoring landscape can be a hard task. The main reason for this is the sheer amount of available solutions. Even though, each of them has their own reason for existence. One challenge during the discovery phase is to find out if the tools you selected can work together. If they have integrations for each other or if they can use the same storage backend. OpenAPM aims to help you find out which parts can work together and how you may use them in combination. Further, it gives you some inspiration on what you can change to get your perfect monitoring stack. Let’s assume you already did some research. You found out that in order to fulfil all requirements you need ToolA, ToolB and ToolC. You know that ToolA stores metrics by using ToolB. Now you need to find out if ToolC can even visualise data stored in ToolB. Is there any alternative you could use for data storage? Are there any alternatives or additional tools that can store data in ToolB? You get the point. Creating your landscape is as simple as clicking each tool you think you want to use. 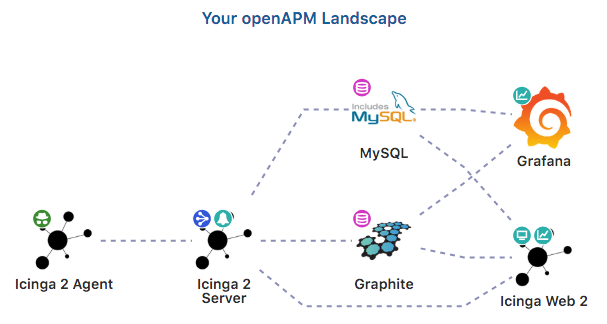 OpenAPM then creates a nice visualisation on how your monitoring infrastructure would look like. Icinga is part of multiple categories on OpenAPM and can be selected as a collector or agent, for visualization, dashboarding and alerting. You can try multiple storage backends and find out if they fit to the setup you thought about. Replacing single components is easy as OpenAPM clearly shows you what is possible and what not. Try it out yourself on openapm.io!